DIVA is a chain of fine dining restaurants in India. A brainchild of Chef Ritu Dalmia, each restaurant is famous for its own unique style and menu. A new offing from the same team is Diva Spiced. Situated at Meherchand market, it has taken the space of the old Chez Nini, ‘DIVA Spiced’ is an all-day dinning café offering Modern Asian Cuisine. Reflecting Ritu’s signature style of fresh and wholesome ingredients, the café introduces a menu which is a culmination of flavours, spices and innovations from the South East Asian belt. As Staying true to her classic style, a definite splash of European technique and presentation is evident in the cuisine. DIVA Spiced is a 70 cover café spread with a ground and first floor seating. Keeping up with the DIVA legacy, Spiced has a warm and a cozy ambiance, but unlike other Asian cuisine venues it has its own take on decor.The interiors of the cafe have been designed by Anita Dalmia with a combination of vintage and contemporary style. 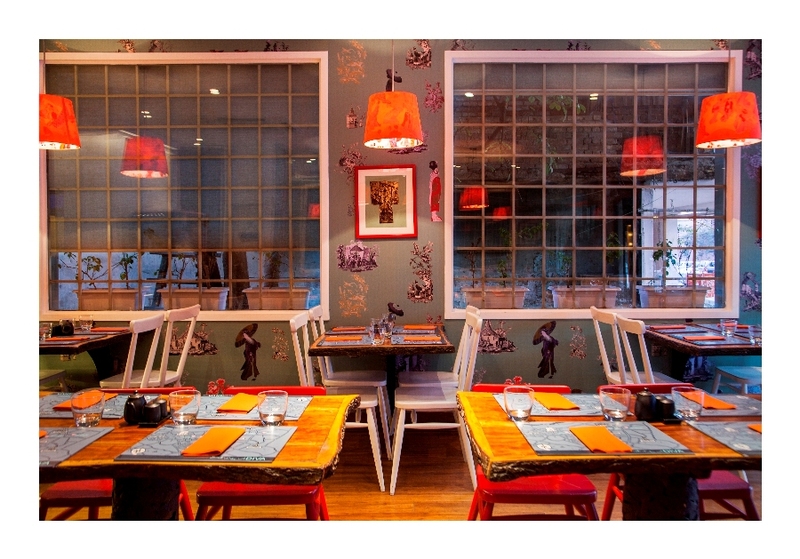 The wallpaper is quite quirky with images of Asian women, Asian motifs and sightings while the chairs and furniture have an industrial appeal. Keeping Asian minimalism in mind the look is overall quite subtle with a play of bright colours. 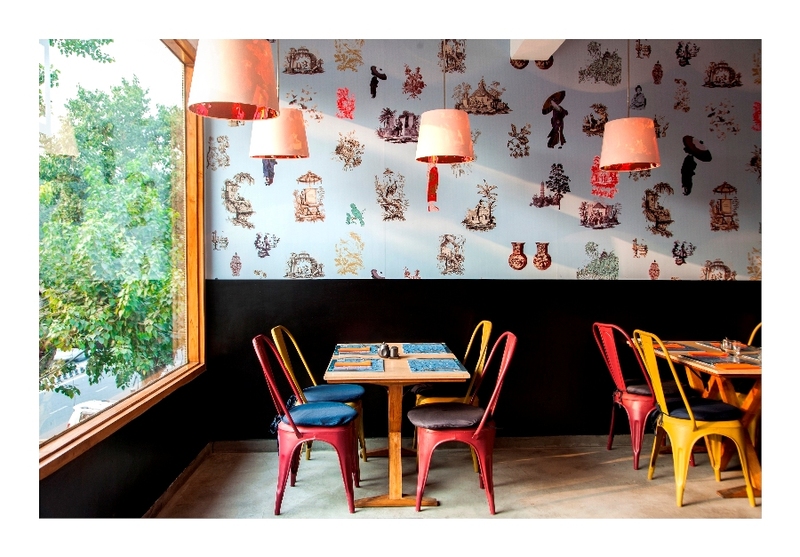 The style is very cafe like while the food is Ritu Dalmia’s take on Asian cuisine. Not for the weak-hearted or for people who do not like experimenting, the menu is a culmination of a lot of innovations, ranging from steamed crystal dumplings to grilled, fried and baked dishes. Some of signature dishes include tapas dishes like Panko Crusted Arancine filled with corn & chili jam, fried Zucchini flower stuffed with Tofu and Feta, Pork belly skewers with spicy yuzu Lemon dressing. For the mains there is a large variety like Goan Prawn Curry simmered in kokum and coconut served with ginger rice, stuffed baby eggplant in a whipped fennel sauce, Miso Marinade Salmon with soba noodles etc. For a sweet ending there are the regular DIVA desserts and a few special ones for Spiced such as a Spiced Mess- Lemon Grass Meringue with mascarpone cream and berry compote and the special black pepper infused chocolate fondant served with basil ice cream! Posted on April 13, 2015 April 13, 2015 by AparnaPosted in Food and Beverages, ReviewsTagged alcohol, asian, Café, celebrity, Chef, Chinese, cuisine, decor, Delhi, Diva, Food and Beverage, review, Ritu Dalmia.